Many businesses require the delivery of product data through networks like the GDSN (Global Data Synchronization Network). To meet this mandate, companies need help with the process of syndicating product information with trading partners. 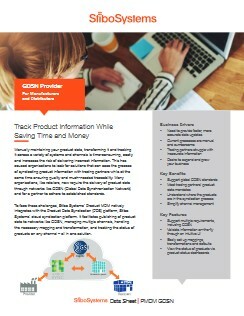 Download the GDSN Provider data sheet to learn how to get the most out of using GDSN. Mauris non tempor quam, et lacinia sapien. Mauris accumsan eros eget libero posuere vulputate. Etiam elit elit, elementum sed varius at, adipiscing vitae est. Sed nec felis pellentesque, lacinia dui sed, ultricies sapien. Pellentesque orci lectus, consectetur vel posuere posuere, rutrum eu ipsum. Aliquam eget odio sed ligula iaculis consequat at eget orci. Mauris molestie sit amet metus mattis varius. Do.